Perfectly portioned, this classic malt vinegar will deliver just the right amount of tang to your customers' food. These 9 gram packets are ideal for any restaurant, diner, convenience store, cafeteria, or take-out station and offer a quick and easy way to enhance profitable menu items. The 9 gram size is great for offering easy portion control for your customers. This helps prevent them from taking excess and saves you money. This zesty malt vinegar is perfect for enhancing a variety of items from classic fish and chips to hamburgers, sandwiches and salads with tangy flavor. Made from only natural ingredients, this malt vinegar will delight your customers with the traditional taste they know and love. A brand you can trust to deliver premium sauces, Flavor Fresh fills each portion control packet with wholesome ingredients and classic recipes. This is a great tasting vinegar at a much less price than on other sites or through vendors. It tastes great on salads, subs or on fish. I would recommend it. I love the tangy flavor of malt vinegar and these are some of the best I have ever had. The packets are great for our fired fish dinners. This is a great valued vinegar that tastes great. While we don't use them often, it is great to have on hand for customers who do. My customers were used to another brand which tastes better than this one. I will be going back to using the other brand since some of my customers are upset, but if this is not a main item you serve with your food, then this portion and price should be sufficient. We appreciate your review, Sam! If you are looking for a different recommended item that would better suit your needs, please contact our Customer Solutions team. Very good vinegar for french fries or fried fish. This a product that I will always keep buying. I use this product over the bottles for inventory control. We don't use a lot of vinegar in our restaurant. Every now and then a customer ask for some to put on their fries. I was happy to find these packs. Saves us lots of money. Great to have on hand for French fries. This is a convenient sized package that I can keep some in my car for restaurants that don't offer vinegar. These are good for offering with takeout orders of french fries. Customers like the convenience of them. Great small 9 gram portions. Great on potato chips too. 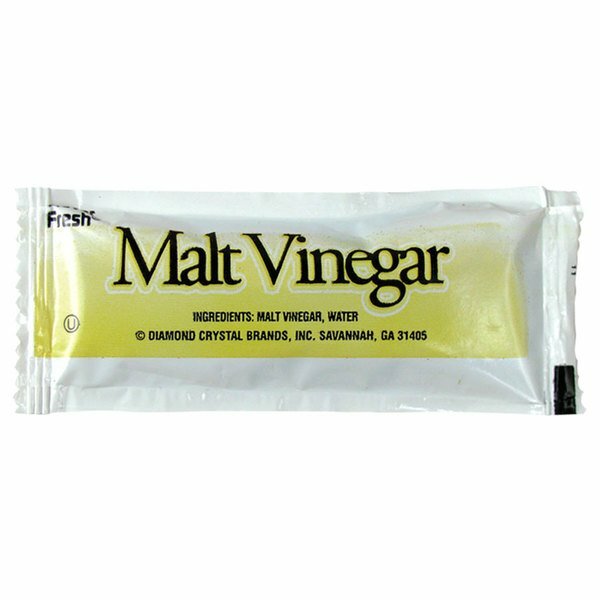 these malt vinegar packets are great for small stores that sell a lot of fried foods. the customer can have a small portioned amount of malt vinegar and won't use too much. Dont use alot of malt vinegaqar in our italian restaurant so very glad to have the packets. It makes giving this product so much more conveneient. Can not beat the price! These packets are great! Looks different but tastes just as good as the name brands! Excellent value and sure to please your customers! Hard to find item but easy to find on Webstaurantstore.com! Perfect complimentary item to English style fish and chips, it's just not right without it! Had a hard time finding this locally, and Web Restaurant has it as a stock item. Packaged well to prevent breakage/spillage. Exactly what we are looking for. Just what the customers wanted.